The first dress is finished! I used Riley Blake Fabrics. I fell in love with this fabric and bought yardage to make something for my home but then I just did not want to cut it. It sat in my fabric closet for years and when I decided on making Little Dresses for Africa, this was my first pull. I love the happiness of the colors! I hope this will make a little girl very happy! I was wring on the sleeves last night and realized that I did not have a safety pin in my sewing rom to pull elastic! How can I not have a safety pin, LOL! 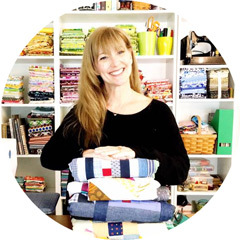 My dear garment sewing goddesses on Instagram had so many amazing ideas! The best thing about Instagram is if you need immediate assistance, there is so much support! The number one answer was a bodkin. I do not own one so I was out of luck but it will be added to my next fabric shop shopping list. I did find this fantastic tutorial by Kathleen on Fashion Incubator. This WORKS and it is super easy. My instagram friends did let me know that this method is not great for stretchy fabric or waistbands. For my dresses I will be using Aurifil 40wt ( the green spool) and If I have the coordinating colors 28wt ( the gray spool) for topstitching. These are my personal favorite for sewing of high use items or when you wish to have a little more pop! So YAY for #theyearofgiving and I am so excited I am off to a good start! It's lovely. Props you for the quick finish and for supporting such a great cause. Sorry that should be "props to you". I've been having such a time with my keyboard lately. That is a darling little dress. I promise that some little cutie will be thrilled to receive it. I do like those pretty colors, they work beautifully for making a happy dress. You've really started out right for your year of giving! I am sure that you will make a little girl very happy. Lovely dress! How darling! Love the style. It's perfect for that fabric. What dress pattern did you use? It really turned out adorable. So was it really easy? And what in the world is a bodkin? What an adorable dress. Some little girl will love it. One of my friend's daughter has gone to Haiti twice in the last 3 years (medical team) and our Bee has sewn dresses to take. It was so much fun. And we got to see pictures of some of the girls in their dresses. Cute pattern - where do we get it! Is it a Simplicity pattern?